STACK Expert Kait Fortunato says, "Say no to 'diet foods.' Eat the real thing in the right portion, and really enjoy it." One thing I like to tell the athletes I work with is there are no good or bad foods. The only bad foods are those that have spoiled. Putting a label on food sets you up to overeat before you even take your first bite. If you label a food as good, you may think, "Oh, I can eat as much of this as I want; it's good for me." You ignore all hunger cues and pay no attention to portions. On the other hand, labeling a food as "bad" might cause you to feel guilty once you start eating it and tempt you to just finish it and start over again tomorrow. In an ideal world, every athlete would eat pristine, clean foods every single day, but this is unrealistic in the long term. All foods have a place, and you can eat what you love in the correct amounts. It's about behavior — why you are eating versus what you are eating. Are you actually hungry? Are you feeling bored or upset? If the latter, first try to deal with the emotion and note your tendency to eat out of stress or boredom. If you think this happens daily or even multiple times a week, seek help. Binge eating is a real disorder and help is available. You do not have to go through life struggling with this. The athletes I work with also struggle with an all-or-nothing mentality on workout days versus rest days. They think, "I can afford to go out to eat or indulge in some dessert, because I had a great workout today." Ideally, rest days and workout days should be similar in food quantity and quality. You do not have to do anything to earn your food. You need adequate calories even on rest days and rest weeks! It's important for athletes to focus on balancing macronutrients (carbs, protein and fat) and getting pre- and post-workout fuel, but it can come from a variety of sources. I recommend purposely finding a place for the food you love. There's another reason why I encourage athletes to avoid diet foods—"low-fat" this, "low-sugar" that. Yes, they can cause you to overeat, but they also have an off taste. You might be more tempted to overeat a low-fat ice cream than to enjoy a regular portion of the real thing, which is way more satisfying. If fat is removed, it's often replaced with more sugar to make it taste better (or vice versa), not to mention the addition of artificial ingredients. 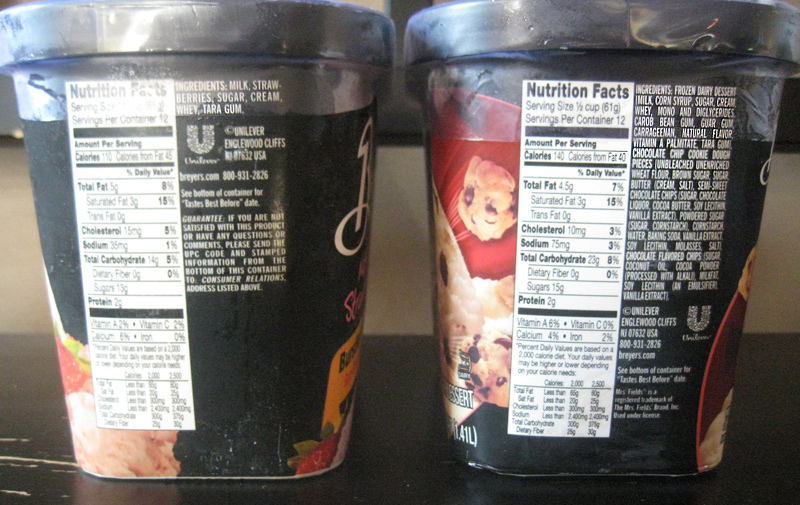 The photo above shows the nutrition labels for an all-natural ice cream (left) and a low-fat ice cream (right). The first thing we notice is that the ingredient list for the low-fat ice cream is two or three times longer than the ingredient list for the all-natural ice cream, including some ingredients that are hardly recognizable. Plus, although its fat content is 0.5 grams lower, the low-fat ice cream has 30 more calories, 40 more milligrams of salt, 9 more grams of carbohydrates and 2 more grams of sugar. I rest my case. Say no to "diet foods." Eat the whole, real thing in the right portion and really enjoy it.